Hello, do you miss us? I'm not sure we're actually back yet, but I hate to think we're nothing but a mausoleum of dead links these days. For those many who keep posting that some of our older links are dead: yes they are. We keep things up a generous amount of time, in many cases 6-8 months, and we don't have the server space to keep up the audio to everything we've ever written about. I also don't have the time to go and remove every dead link, so I apologize if you've clicked through thinking you were getting this song you've been looking for since 1987 only to get an ugly 404 page. We're pretty nice guys, so if you can just post a comment or better yet, email the person who wrote the piece, we can usually oblige you. So recently a few new vinyl only record stores have opened in the Los Angeles area, Vacation Vinyl and Origami. This is great to see, and so far I've already spent a fair amount of money at these places. Origami is particularly dangerous for me, as it's right next door to The Echo and stays open until 2am, meaning that if I stumble drunk out of a show at The Echo with a loose wallet, I come home with an armful of impulse buys, especially 7" records. I know this happens, because it happened Friday. But I had one of those accidentally really good purchases. 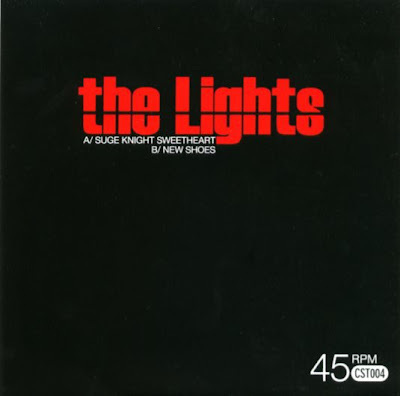 I picked up a 7" by this band called The Lights, a band I thought Mike and I played a gig with 3 or 4 years ago. Having now listened to this 7", I am certain this is not the same band, although they both do wear their post-punk influences on their dark sleeves. I think maybe that band we played with were The Red Lights or something. Did I mention that sometimes Origami sometimes has free beer? Check them out. This definitely has some early 80's Factory sounds (yes, some Joy Division,) a fair bit of Mark E. Smith on "New Shoes," and just overall tastily syncopated, bass-driven sparseness. I guess it's not terribly different from the A-Frames, either. Anyway, you can listen to it and make your own clever influence assumptions.